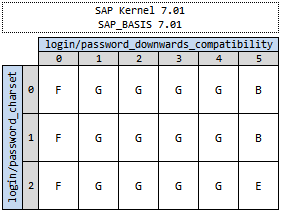 in this article, I'd like to summarize what I found out about SAP's password storage mechanism (for SU01 users, not the SecStore). The passwords of all users are stored in table USR02 as one (or more) cryptographic hash value(s). Table USH02 and some others contain the password history (see SAP Note 1484692). This history used to be limited to the last 5 entries per user before NW 7.0; meanwhile the number of entries is customizable via the profile parameter login/password_history_size (see SAP Note 862989). The hash algorithm has changed several times over time – either due to weaknesses or as a result of the increase in computing performance (see "CODVN H" below). 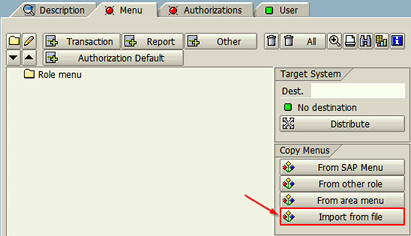 SAP Note 1237762 gives a good overview of hash attacks and has some rather helpful tips on how to prevent them! The password cracking tool John the Ripper (with the "Jumbo" patch) supports two of SAP's common hash algorithms (CODVN B & F/G). Give it a try, if you're serious about the security of your passwords! (upper-case) Unsupported characters (probably the same as with CODVN B) in the password and salt are replaced by an apostrophe (»'«). The MD5- and SHA1-based algorithms consist of two hash iterations with "some Walld0rf magic" in between — for details, have a look at this posting in the john-users mailing list. Openwall Wiki: Excerpts from john-users mailing list ← search for "SAP"
Paper: "Perfect Storm - The Brave New World of SAP Security"